Maha Shivaratri in 2019/2020 - When, Where, Why, How is Celebrated? Maha Shivaratri, also known as the Great Night of Shiva, is a Hindu festival which is celebrated annually on the 13th or 14th night of the new moon in the Hindu month of Phalgun and during Krishna Paksha – which is between March and February on the Gregorian calendar. According to the Puranas – Sanskrit writings which were written around the 4th A.D – during the great agitation of the ocean known as Samudra Manthan, a huge pot of poison emerged from its depths. This pot of poison disturbed all of the gods, as well as all of the demons, for they all knew that it was large enough to destroy the entire world. So they all ran to Shiva and asked for his divine help. Shiva decided the best way to deal with this threat was to drink the poison and save the world from its horrible effects. 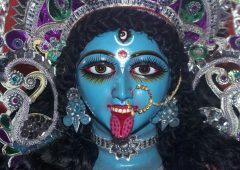 After he drank the noxious mixture, it is said that his throat then turned blue and he was, from that moment on, called the blue-throated one or Neelakantha. Maha Shivaratri was then created as the celebration of Shiva saving the world from this disaster. However, while this is the main legend of this festival, it isn’t the only legend associated with it. In another legend, Brahma and Vishnu were fighting over who was the superior one between the two of them. They battled day and night and the fighting grew so intense it horrified all of the other gods who were watching the battle. In fact, they were so shocked they ran to Shiva to ask for his divine intervention in the matter. After Shiva arrived at the battle, he decided to show them how futile their fight was by assuming the shape of a huge fire column in between them the two of them. At that moment, Brahma and Vishnu decided that the person who could find the end of this epic fiery column should be named the one who is superior. So Vishnu took the form of Varaha and went into the earth, while Brama took the form of a bird and flew towards the sky. Although both of them tried as hard as they could, neither one could find the end. However, Brahma did come across a Ketaki flower that was floating slowly towards the earth. When he inquired where the flower had come from, the flower replied that she had been placed on top of the pillar of fire as an offering to Lord Shiva. Since Brahma was unable to find the top of the column he decided to take the flower as “proof” that he actually did. However, when Brahma said that he had found the top of the pillar, Shiva knew instantly that he was lying and decided to severely punish him. He did so by placing a curse on him so no one would every pray to him. The Ketaki flower was also banned from ever being used as an offering for supporting Brahma’s lie. Since Shiva manifested himself on the 14th day in Phalguna, worshiping Shiva on this day is said to be auspicious. In honor of Lord Shiva, many devotees on this day fast. While some of those who fast will do so on a diet of milk and fruit, there are others who won’t even drink a drop of water on this day. Many devotees also believe that worshiping Shiva on this day with a sincere heart will not only absolve them from their sins and liberate them from being reincarnated, but it will also bring them luck and happiness. 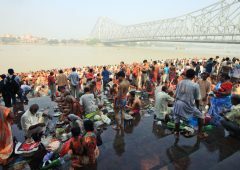 Many devotees will also take a ritual bath in the Ganga Rive, early in the morning on this day. They then put on brand new clothes and visit the Shiva temple to ritually bathe the Lingum with water, milk and/or honey. Where is Maha Shivaratri celebrated?